Chad Reed is a multi-time Supercross champion, having won the U.S. AMA Supercross Championship in 2004 & 2008. He is not only one of Australia’s most successful motocross racers, but he has proven himself on the world stage as one of the greats of Motocross and Supercross. He is one of Australia’s highest-earning sportsmen. Like many other champions, he got his start at a young age. He had his first ride on a dirt bike at age 3 1/2. His first bike was a Yamaha Pee Wee 50. His father Mark Reed has trained him from the start, and the family bought a 25 acre property in Kurri Kurri, New South Wales. They built several tracks for Chad to practice on. His family supported him in his early years of competition and traveled all over Australia every weekend so that he could compete against riders from the rest of the country. He left school at 15 to pursue a racing carer and by 2000 had two Australian titles to his name. He began his professional career in 1998. In 2001 he traveled to Europe to compete in the F.I.M. World 250cc Championship, racing for the Kawasaki factory team. He won the Grand Prix of Lierop (Netherlands) and eventually finished the season in second place behind World Champion Mickael Pichon. In 2002 Chad moved to the U.S. and rode with the Yamaha factory team. He won all but two races that season and went on to win the 125cc East Coast Supercross Championship. 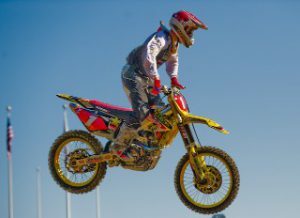 In 2011 Chad created his own racing team TwoTwo Motorsports and competed on a Honda CRF450R. He was a consistent podium finisher through the SX season and finished up second overall, just four points short of taking the title. His 2012 season started strong, but he was sidelined after the seventh round after a nasty crash, which left him with a broken tibia, fibula, two broken ribs, T6 vertebrae, and torn anterior cruciate ligament. He still finished twelfth overall after missing the final 10 rounds. 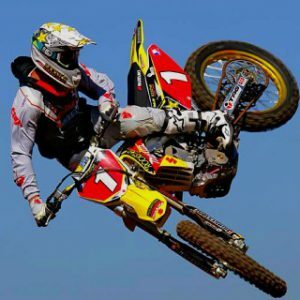 Chad has been one of the most consistent riders of the 2000-2009 decade along with his main rivals James Stewart and Ricky Carmichael. He has never finished a full season outside the top ten, and only twice outside the top five. In recent years he has taken on a promoting role and been instrumental in bringing Supercross to Australia by helping set up the Australian Supercross Championship. The series brings international riders to Australia and New Zealand to compete on U.S. style Supercross tracks. Reed has confirmed he will race a Husqvarna for the 2018 season. He has been cleared for racing after undergoing surgery in October to repair two fractures in his ankle. So who’s better? Toby Price or Chad? Thanks for comment Arran. Funny you mention Toby Price, he’s the subject of an upcoming Bio. It would be impossible to say who’s better. They are both world class Australian riders at the top of their fields, Chad Reed in Motocross and Supercross, Toby in Enduros and desert racing. They both have a list of achievements too numerous to mention. As of today (08/01/18), Toby is currently on day 2 of the Dakar Rally. In 2016 he became the first person ever to win on their second attempt, and also the first Australian to win any class.